Maria Jimenez has dedicated her adult life to improving the lives of others. In May 1957, Maria Jimenez arrived in Houston, having just left her native Coahuila in Mexico to reunite with her father. Her family settled in a small Magnolia Park home near Maria’s school, Franklin Elementary. There, as a first grader, she experienced her first dose of anti-Mexican sentiments. Within the halls, classrooms, and playgrounds, school officials forbid Maria and other students to speak Spanish lest they face expulsion. In few moments of kindness, one teacher, who noticed Maria’s confusion, secretly instructed her in Spanish so she could understand the directions. Contrastingly, Maria remembers speaking in Spanish to other Latino children who threatened to report her. 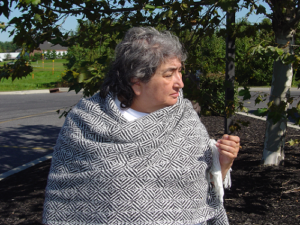 The environment was “repressive…the access to anything that was Mexicano was very limited,” she recalled. The denial of language and culture was the first, most obvious form of discrimination thrust upon her. It impacted every aspect of her life and set her on a path of life-long activism. Maria’s school teachers insisted on mispronouncing her last name, Jimenez, in a more Anglo-friendly way with a hard “J” sound rather than the natural soft “H” sound in Spanish. Her classmates openly made jokes about lice-infested Mexicans and clearly rejected the entry of Mexican families to their communities. Sociologist Tatcho Mindiola Jr. found that many Chicanos, second and third generation Americans, had negative attitudes toward native Mexicans or recent immigrants from Mexico because the Chicanos “[did] not perceive themselves as belonging to the same ethnic group.” Further, denying Mexicanos the use of their native language inhibited communication between the two groups. 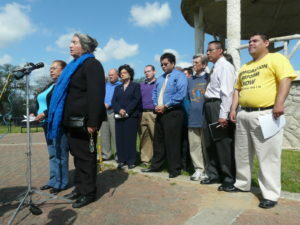 Maria Jimenez speaks at a news conference at Hidalgo Park in Houston’s East End to announce a local march and a delegation traveling to Washington, DC, to join the national march for comprehensive immigration reform in 2010. The March for America drew approximately 200,000 participants to the National Mall. Maria Jimenez speaks to 4000 persons at a pick-up truck rally after marching through a suburb of Atlanta, Georgia during the Immigrant Workers Freedom Ride in September 2003. 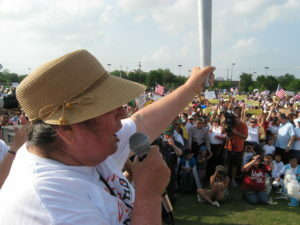 Maria Jimenez speaks to the crowd gathered at a march on May Day 2012 after carrying the Antorcha Guadalupana, the torch for immigrant rights and dignity. 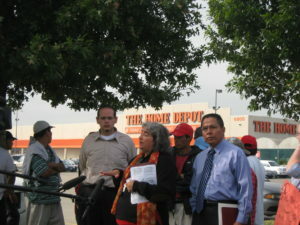 Maria Jimenez speaks at a press conference in front of the Home Depot on Bellaire and Beltway 8 to denounce a crack-down on day laborers’ constitutional rights to seek work in public areas in October 2007. 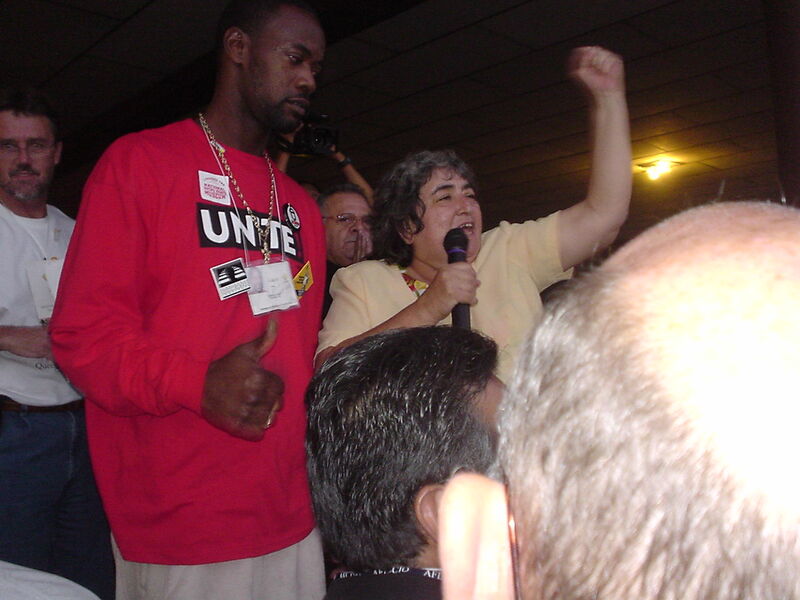 To access images, audio, and transcripts of Maria Jimenez from the UH Digital Library, click here. “I admire people like Maria Jimenez because she’s not a Johnny come lately. She’s been doing this basically all her life. You know talk about immigrant rights- she was doing and working for that 30, 40 years ago.” — Carlos Calbillo, May 3, 2006. Maria Jimenez is mentioned in two articles of the Nuestra Historia issue of Houston History. Click on the links below to read the articles. Finding A Way: Developing the Center for Mexican American Studies at UH by Tatcho Mindiola, Jr.
Click here to read Tatcho Mindiola’s article on assimilation, the denial of language, and the impact that restriction has on Mexican Americans. The article appeared in The Houston Review of History and Culture of the Gulf Coast and is quoted by author Denise Gomez in this article on Maria Jimenez. Named a Petra Fellow in 2010, read about Maria Jimenez and the Petra Foundation here. Learn more about the UH Center for Mexican American Studies here.